This entry was posted in Family and tagged donna, little girl. Bookmark the permalink. That is a darling photo! You’re right .. what a treasure. How nice. We rarely see little girls in dresses anymore. Just precious! 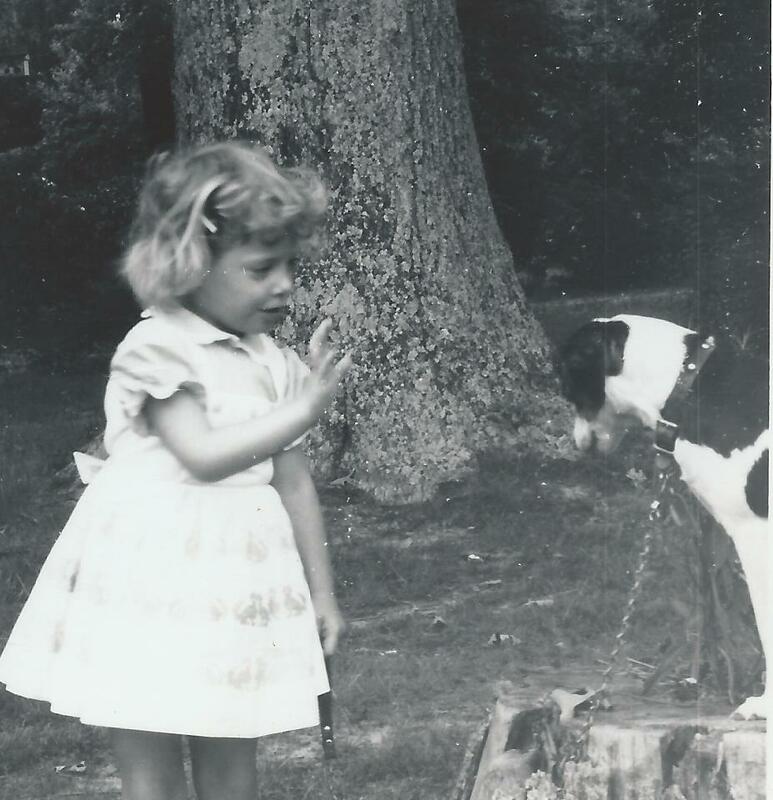 What a darling photo and I do believe Donna is lecturing Frances on the finer points of taking a walk OR as you said just teaching Frances to “stay”……SO cute!! The tree stump almost brings Frances to eye level. There is definitely a little conversation going on there. Adorable photo. What I find! I have several long-term-ongoing-scrapbook projects going on with my old family black and whites! LOVE it! … and clever way to ‘sneak’ in a special happy birthday! Sweet! Those old pictures just take us back to a special place. I do think there was a lesson going on there! The joy of seeing old photos and reminiscing. I got her to wear dresses for a while…but it wasn’t long before she had to have pants to wear!! But she and Barbara, for a long time, had a new dress to wear to church every Sun. I really loved making those little dresses. Great picture!! Happy Birthday, Donna!! Love you, looking forward to y’all’s next trip !! Lovely sentiment for a birthday wish! What a great birthday wish! Thanks for the idea, Dianna. I need to borrow some photos and scan them. Precious photo, Donna is so cute and that Frances what a good dog. How sweet! And hope that pup is still doing well… (yes, in my head animals never die). That is a sweet photo! Hope your niece has a wonderful birthday! Thank you everyone for the Birthday wishes ! I don’t remember ever seeing this photo before. Unfortunately I don’t remember Francis…I wish I did because it appears we were very good friends. But I do remember having lots of new clothes made by my Mom and I even remember being allowed to pick out some of the fabrics, which was always fun. Miss you too Marshall ! So cute!! I thought maybe she was teaching the dog a new trick. And aren’t you lucky the pictures have names written on the back!! I need to go through mine and write what I know. Cute pic of dog and child. It is fun to find old pictures. This one is sweet.